Ok, confession: I feel like I'm totally failing my sankalpa. I'm pretty sure "fail" is not a part of the sankalpa practice. But, I just feel like all I'm doing is checking dumb stuff off the to-do list. I'm not feeling like a creative risk-taker. I'm feeling like a bogged-down hockey mom schoolmarm. Not particularly glamorous, creative, or risky. Hmm. There's tomorrow, I suppose. The photo above is a figurine and cheese grater. I had no part of coming up with this duo. I barely got it posted. Leeway had to remind me and make the magic happen. #TwinTuesday is a testament to your creative risk taking. Such an awesome combo. It makes me want to go out and buy more imaginative figurines today. And you usually are the one to remind me to get thinking on this stuff. Today is a snow day here. Did you get one as well? This is both creative and risky! 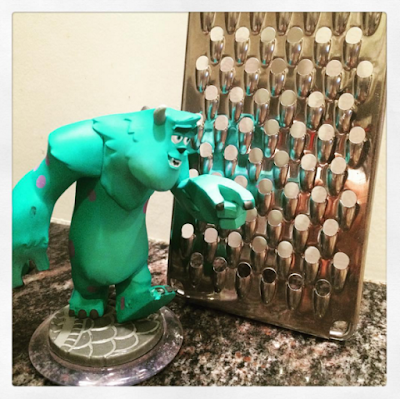 Do you see how close that figurine's finger is to getting cut on that grater?! You and Lee blog continuously. If that is not daily creativity, I don't know what is.